It's fast getting to be bee, wasp, and yellow jacket season. And that means that these insects, and the sting hazard they pose, will soon be present around your yard and in the parks and other places you walk and play with your dogs. If your dog or cat is ever stung by one of these insects, or if they ever eat one (that's right Labs and Spaniels... I'm looking at you! ), you may be able to treat them effectively at home, but you may well need to take them to the vet. The severity of any pet's reaction to a sting is difficult to predict and can be highly variable, even within the same pet on subsequent stings. So always be aware and know what to look for. In the event of a sting you should watch your pet closely for itchiness, hives/welts on the skin, swollen eyes, vomiting and/or diarrhea, breathing problems, or even collapse. If it's just mild itchiness or swelling (that isn't present on or around their face), and your pet isn't too uncomfortable with it, you may be able to treat them at home, so continue reading along. However, if the swelling is wide-spread (especially around the face and/or neck), the itchiness intense, or there are any digestive signs, breathing problems, or collapse, your pet needs to be seen immediately by a veterinarian for evaluation and treatment. Don't waste time trying to get Benadryl into your dog, just proceed immediately to your vet or the nearest Animal ER or open veterinary clinic. Once your dog is safely at the vet, see the section below about how to prevent future stings and what to have on hand to treat a dog with a history of severe bee sting reactions. It's a good idea to keep some diphenhydramine at home and in your pet's first aid kits, and to check with your veterinarian in advance to ensure that it's safe for you to give your dog this medication in the event of a sting. Diphenhydramine is the active ingredient in regular Benadryl, and it can be very useful in sting allergic reactions. Note that it doesn't have to be Benadryl brand, as you can also get the generic variety (diphenhydramine) which should work just as well, and cost you less. However, whether you go with generic or brand name, it is vitally important to ensure that you get a medication that ONLY has diphenhydramine as an active ingredient! You don't want any additional pain relievers, decongestants, or other drug types in there. So no Benadryl Cold and Flu, Benadryl Cold and Allergy, Tylenol PM, Advil PM, or any other combination medications containing diphenhydramine – just straight up diphenhydramine. And also make sure that the liquid does NOT contain any xylitol, which is highly toxic to dogs! 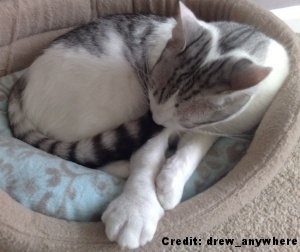 The typical dose of Benadryl (diphenhydramine) for pets is 1–2 mg per pound of body weight (please refer to "Warnings When Giving Your Pet Benadryl"). Generally speaking, pets under 10 pounds should get liquid, while pets over 15 pounds should get pills. For pets weighing between 10–15 pounds, it's often easiest to give them their dose using a half or whole pill, but some may require or do better with the liquid form. For liquid dosages, determine the concentration of diphenhydramine based on the medication's label (use the illustration below as a guide) and enter those values and your pet's weight into our "Diphenhydramine Liquid Dosage Calculator." The calculator will tell you the maximum diphenhydramine dosage of that specific liquid formulation for your pet (in teaspoons). To get your pet's "low-end" of their dosage range, simply divide their calculated maximum dosage by 2. To determine your pet's dose in pills, simply multiply their weight (in pounds) by 1 to find their low-end dose in milligrams, and multiply their weight (in pounds) by 2 to find their maximum dose (again, in milligrams). Give them a dose that falls within that range, using whatever combination of whole and half pills it takes to get you to a dose within the dose range you've just calculated. For example, if your pet weighs 40 pounds, their dose range would be between 40 mg and 80 mg. You then look at the medication box to find out how many milligrams (mg) of diphenhydramine is in each pill and give them the combination of full and half pills that gets them within that dose range. (1) Make sure that the medication you buy only has diphenhydramine as the active ingredient (i.e., don't use a combo cold + flu, or other combination medication). This product, featured below, is an example of a safe product for dogs. It's a useful item to keep in your pet's first-aid kit. (2) Make sure that the formulation of diphenhydramine you get for your dog does NOT contain xylitol, a common sweetener that is fine for people but highly toxic to dogs! If your pet is overweight or obese (be honest), calculate their dose based on what their ideal/target "lean" body weight should be. Benadryl overdosing can cause pets to suffer agitation, sedation, vomiting, heart abnormalities, and other problems. So please be sure to double (and triple) check your doses before giving your pet this medication. Monitor your pet's swelling. If it is no better within an hour, or gets worse at any point, you should take them to the vet immediately for evaluation and further treatment. Similarly, if the swelling is present on their face or neck, or if they are having any difficulties breathing, they should be brought immediately to the vet. But What If You Don't Have Benadryl, or Your Pet Has a Known Allergy to It? If your pet does get a sting that just causes mild itchiness or swelling (that’s not present on or around their face), and your pet isn't too uncomfortable with it, you may have success treating them at home with one of the following. These can be used on dogs or cats. You can apply the vinegar to a cotton ball or pad, or Q-tip and hold directly on the stung area. 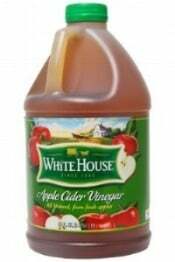 Apple cider vinegar can often neutralize the venom from a bee sting. Do this several times until the swelling subsides. Take care not to get any near your pet’s eye(s). You can easily make a paste of baking soda and water (three parts soda / one part water). Simply apply the paste to the sting area once every two hours for the first day until the swelling goes back down. Take care not to get any near your pet’s eye(s). Aloe gel can help soothe your pet’s stung area. You should only use pure aloe (not a lotion or other gels mixed with alcohol or chemicals). Or better yet, use the gel directly squeezed from an aloe plant. Take care not to get any near your pet’s eye(s). If you ever have any concerns or questions following a bee, wasp, or yellow jacket sting you should always contact your veterinarian. And remember, if your pet’s swelling is widespread (especially around the face and/or neck), the itchiness is intense, or there are any digestive disorders, breathing problems, or collapse — your pet needs to be seen immediately by a vet for evaluation and treatment. 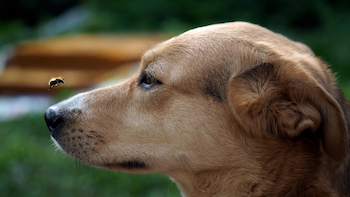 An important point to remember is to not let your pet back out in the yard upon your return home following your pet's treatment for the bee sting that happened in your back yard — though you wouldn't be the first pet owner to do so! Consecutive (repeated) stings that happen close together have a greater chance of resulting in a more severe, more rapid, and more likely-to-be fatal reaction. Keep your pets out of the yard until you've had an exterminator over to take care of your bee/wasp/yellowjacket problem, if indeed you have one. Some dogs sadly have a silly habit of eating bees and wasps, which can be quite the dangerous habit, too. 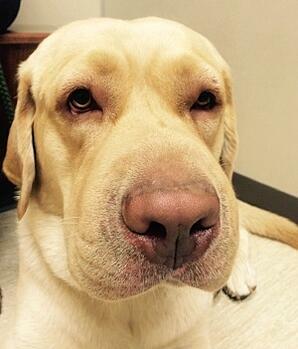 When a dog eats a bee or other stinging insect, any sting that occurs within the mouth or throat carries a much greater risk of breathing problems related to life-threatening swelling that could close up the dog's airway. So along with taking steps to keep bees and wasps out of your yard (like using a good exterminator, setting traps, etc. ), I'd also recommend outfitting your dog with an Outfox Field Guard whenever they're outside during bee & wasp season. Whether it's on a walk or at play in your backyard, the Outfox Guard can will allow your dog to pant, drink, and even fetch... but it won't allow them to eat bees, wasps, and other flying insects! Pre-treat with Benadryl: If you have a relatively defined "bee season" where you live, giving your dog Benadryl daily may help to lessen the severity of any stings they may suffer. This is known as "pre-treating." Unfortunately we don't know for certain whether or not it will work for all dogs and in all situations. Additionally, Benadryl doesn't stick around in a dog's body for too long and typically needs to be dosed every 8–12 hours in dogs, meaning that the Benadryl you've given your dog in the morning may not still be around and active in their system come the afternoon or evening if they're stung. Lastly, Benadryl can make some dogs quite drowsy, so daily dosing (especially multiple times a day) may not be the best way for your dog to be. Go for course of "bee allergy shots": Just like other allergies in people and in pets, some dogs can be "desensitized" to the effects of bee and wasp venom. This series of "allergy shots" — a process more correctly called "hyposensitization" — aims to prevent your dog's body from over-acting to any bee and wasp stings they may get. This is great, given that severe reactions can lead to death before you could even get your dog to the vet, and also because you may not always be around to actually see your dog get stung. If you have a dog with known severe bee/wasp sting allergies and live near a veterinary dermatology practice that offers this service, I'd highly recommend contacting them and finding out if the hyposensitization series might be right for your dog. Off hand, I do know that all locations of the Animal Dermatology Clinic provide this service, and their vets were instrumental in testing the safety and effectiveness of this treatment. Carry an Epi-Pen: When dealing with severe, anaphylatic reactions to stings, time is truly of the essence. If you know that you've got a dog that has severe allergies to bee, wasp, and yellow jacket stings, it may be a good idea to have an Epi-Pen with you whenever you're out or traveling with your dog. The quick shot of epinephrine that these devises deliver may just be the thing that can help save your dog's life and buy you the time you need to get them to the vet. Note that Epi-pens come in both "regular" and "junior" sizes — your vet is best equipped to let you know which size your dog will need (and you'll need a prescription from your vet to get your pet(s) one anyway). Of course, Epi-Pens aren't cheap, and they do expire. To easily check around for best prices of Epi-Pens near you, check the pharmacy price-shopping website GoodRx.com. I hope this article has helped you in your time of need, or that it has helped you learn what to do and how to be prepared in the event of a future sting. Enjoy the outdoors and stay safe!